Rickshaw (a three wheeler passenger cart) was invented in Japan for the first time in 1869 which is normally pulled by one man for the one passenger and was added with paddle .It had a wooden carriage that rode on a steel strong wheels was became a good transportation for early 19 century in Japan . Later after 1930s, the rickshaw were slowly replaced by an advance automobile and spread overseas. 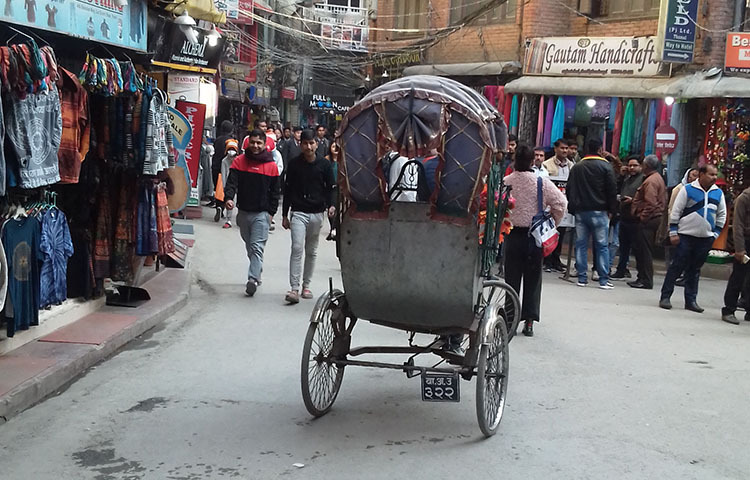 In Mid of 20th Century rickshaw came in Nepal through Indian territory .Due to the landscape of India and south Nepal Rickshaw became a famous transportation unit which later spread in Kathmandu as well . 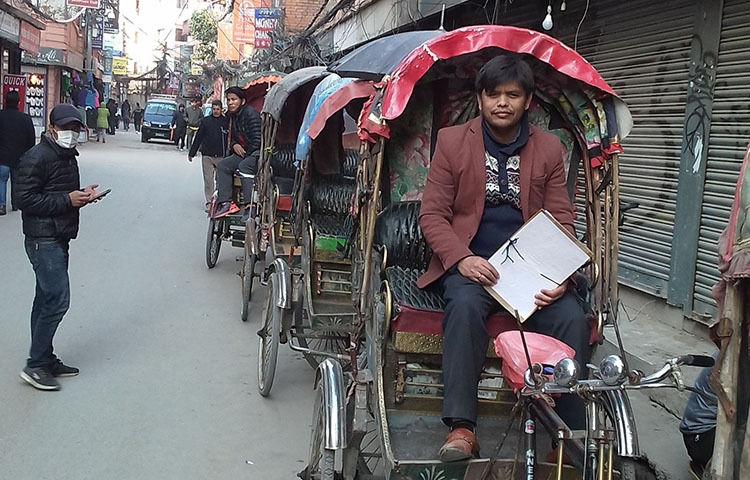 A warm up tour with Rickshaw around thamel. Ending Point: – Saat Ghumti – A seven turning junction. This two hour rickshaw tour is a warm up tour for your upcoming days which lead you towards sea of impatient and experience the colorful tourist hub of Kathmandu. Our guide will be along with you for your comfort tour who will explain about culture, old trade center and many more. In front of Employees provident fund office is your starting point for 2 hour rickshaw tour. Our experienced tour guide will introduced each Rickshaw driver and start ride from there. Ten minute ride will take you Thahity Chowk passing through Nursing Chowk, small stupa and Bhagwati Temple .Natyaswor Temple is major attraction of Thahity Chowk. This part is more mysterious. After almost 20 min. ride through narrow and busy street of TYAUDA take you at ASON, the old trade center. Hopefully, its busiest market in Nepal where local people could find anything they want. 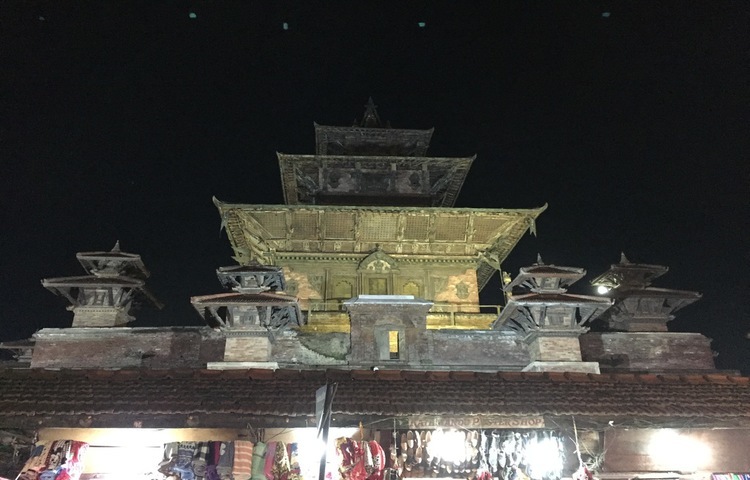 Annapurna Temple, Shiva Parvati Temple, Narayan Temple, Ganesh Temple and kumari Temple are another attraction of ASON along with beautiful market. After 15 min slow ride will take you Indra Chowk passing through 500 years old Krishna Temple , Balkumari temple and Palten ghar .People believe that there was river where we still can find WANGA (a vessel ) 2 miter down from recent surface level .A magnificent two story Akash Bhairav -a aggressive manifestation of lord Siva (a Hindu god ) Temple built during reign of King Pratap Mall in 17Th CAD is major attraction of Indrachowk . Our ride continues towards Makhan Chowk from Indrachowk. Makhan word comes from Newari (a indigenous people of Kathmandu Valley )language .Makha means unknown ,later it became Makhan junction from where could see magnificent view of Taleju Temple (a major deity of malla kingdom ) .Another 30 min ride reach you at Saat Ghumti via Chhetrapati chowk passing through another famous temple , Swayat Kali temple . Due to vehicle free zone we have to walk from Satghumit towards your hotel or go for dinner.